The National Weather Service has issued a *HEAT ADVISORY* for today! Hot and humid conditions will reign over the region today. During the heat of the day, the heat index (how hot it feels) could approach or reach 105 degrees. It's important to stay in a cool place during the heat of the day, and to drink plenty of fluids - even when you are not thirsty. 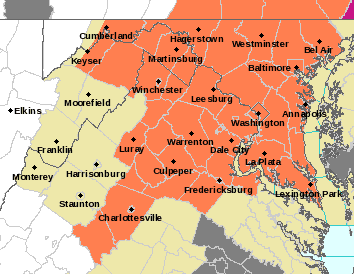 The areas in orange are under the heat advisory. The heat will continue tomorrow with similar conditions expected. The Pulse would like to remind everyone to stay cool and safe today during the hot conditions.